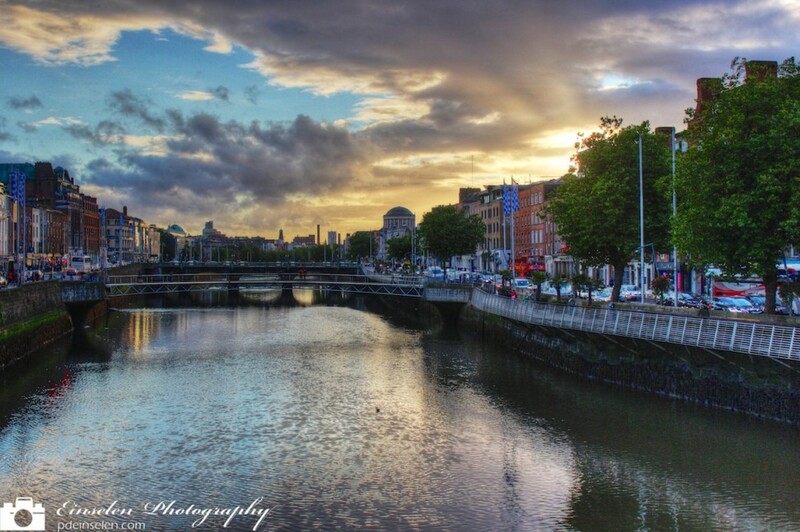 This is a photo from the River Liffey in Dublin, Ireland. The Ha’penny and Millennium Bridge are in the background. The River Liffey is North of the Temple Bar Area, where the Croke Park Classic (UCF v Penn St College Football) activities were taking place. This photo was after the game ended and we were walking back to the Temple Bar area from where the bus dropped us off. The sun was setting so I quickly set my camera to shoot three brackets, -2, 0 and +2 and did a quick hand-held HDR shot. The clouds and colors are all natural, minus the tone-mapping for the HDR shot. You can see some traffic in the shot, but I wanted to compose the photo to minimize this traffic while focusing on the sunset. This is why there are more of the buildings to the right of the frame than to the left.